But let’s get specific! In anticipation of the event, we interviewed some of our speakers to ask them about those first steps, and exactly how they went from having an idea to fulfilling their dreams. 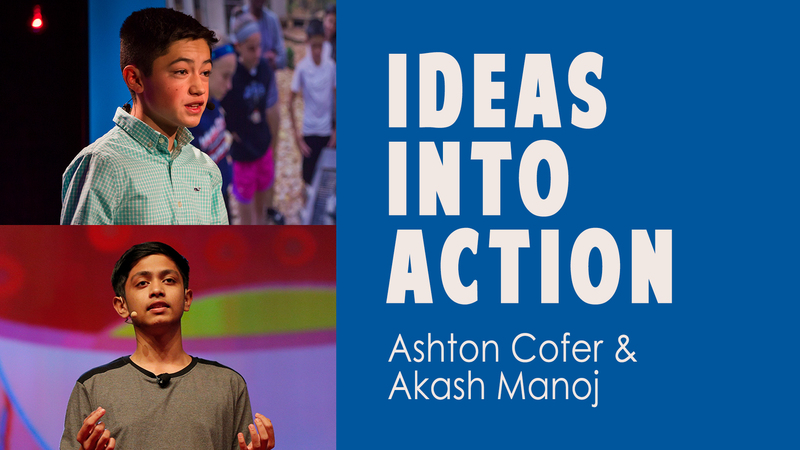 Ashton Cofer (AC) spoke at TED-Ed Weekend 2016 and shared his team’s amazing discovery: a process for recycling seemingly un-recyclable styrofoam! Akash Manoj (AM) is speaking at this year’s conference, and he’ll be sharing the story of how he invented a device to detect silent heart attacks. Two speakers who prove that age doesn’t limit your ability to solve real-world problems. Before you tune into TED-Ed Weekend (live on youtube.com/tededstudenttalks), check out this Q&A with these brilliant young inventors. What inspired you to work on your particular invention? AC: I was originally inspired to work on this invention through my involvement with FIRST Lego League, a program that inspires groups of kids from around the world to identify a problem every year and develop a solution. Working with a group of three other students from my school, we chose the problem of Styrofoam waste, a large issue in not only our community but all over the world. Although the challenge seemed a little daunting at first, it eventually evolved into something that we were determined to solve. AM: I never knew that I would be researching “silent heart attacks” until the day my grandfather was struck by one. I did not start working on this research with the intention of inventing something; instead, I was concerned about the limitations of an existing solution and wanted to innovate it so that it could turn out to be a promising alternative. It was not because I was emotionally affected that I started my research, but it was because I found the problem to be marvelous, and it was because I visualized the ground-breaking implications that the solution to this problem could have. I was, undoubtedly, inspired by my circumstances, especially my inaccessibility to research resources. When I started taking control over them, things started falling in place. I always believe in one thing: there’s always a way out! Developing an invention takes time, and many cycles of attempt and failure. How much were you motivated by inspiration versus discipline? Which do you have to work the hardest to find? And do you have any tricks for keeping yourself inspired and/or motivated? AC: Initially, inspiration was the main factor that motivated this project. However, as the development of the project went on, I would definitely say that discipline was a more prevailing factor. Since my team also had a strict timeline to develop our solution, we had to be disciplined to both work quickly and efficiently and not get discouraged by failures. I’d say that one thing that really helped motivate us during this project was working on it with other like-minded individuals who would always be there when one of us was discouraged. Even if you are working on an individual project, I find that collaborating with others is essential to keeping yourself disciplined and motivated. AM: For me, I would say discipline has a more significant role than inspiration, because anyone can get greatly inspired by watching a TED talk, but what gets one to ideate and turn ideas into action is discipline. It is crucial for researchers to be disciplined, and it took me almost a year to be able to master it. It is also essential for everyone to get mentored by someone, and perhaps that was something I had to work the hardest to find. The trick to staying on track and getting motivated is simple: just think of the journey as a whole, not the goal, ask as many questions as possible, and learn from failure. This should probably take you where you want to go. What were the very first steps you took on your path to making your invention? AC: The very first steps that we took were to complete background research on the problem and to make a running list as a team of all the possible ideas that we had. We also found that reaching out to experts in the field (in our case it was activated carbon researchers) was extremely helpful in our initial research and getting expert opinions on possible ideas. AM: I started off by doing A LOT of Google searches. First, I made it a point to understand what was going on: the working of the heart and other related organs and life processes, the nuances of medical terminologies, and of course, how a (silent) heart attack occurs! This took me a lot more time than I actually had imagined. You see, it was too much to take in, for an eighth grader. I went to university libraries (which were VERY far from where I lived), read medical journals, and tried to learn as much as I could. I, then, got access to the entire health record of my grandfather. Though I received dozens of rejections, I was fortunate to receive lab space, mentorship, and funding from a government-run institution: SRISTI-BIRAC. I started my research and worked on my experiments right from that moment. Do you ever feel stuck? Are there any specific steps you take to help yourself feel unstuck? When you need help, who do you turn to? AC: Being “stuck” is probably one of the most common occurrences that my team had to deal with. Throughout our research, we had to deal with countless testing failures and at one point we even considered giving up and switching to an entirely different project. For example, during our research, we were trying to emulate the high temperature commercial process of creating activated carbon but instead using polystyrene as the input material (rather than wood or coal). Every single test that we did kept on resulting in the product vaporizing and we had no idea what was causing it. However, after simply decreasing the temperature of the test, we were able to get a successful result. This process of taking a step back, carefully examining what was going wrong, and persevering truly helped us to overcome being stuck and it was much better than if we had quit. In addition, having other students to turn to was also crucial in overcoming these adversities. AM: I often feel stuck when something, like technical miscalculations or process errors, in my research seems to be a never-ending problem. That has been my mantra all this while! When I was too stressed, my parents would have no stone unturned to help me feel better, and I think that has kept me going. Do you have any advice for young would-be inventors? What is the most valuable advice you’ve received on your journey so far? or apply it to a different situation. By combining your own ideas with the perspective and experience of someone else, inventions can truly be taken to the next level and make a difference. AM: The most valuable advice I’ve received on my journey is not to let my age limit my thinking and to question everything, big or small. My advice to young would-be inventors would be to observe the world around them for inspiration, because seemingly mundane things can be explored in depth. Look around for problems, and you can find one to work on! More about Ashton: Ashton Cofer is a 16-year-old inventor with several patents pending, including a glove to reduce hand tremors, a device to detect drowsy driving, and a method to convert polystyrene foam waste into activated carbon for purifying water. He and his teammates won the 2016 Google Science Fair’s Scientific American Innovator Award for this latest invention that addresses the global environmental problem of Styrofoam waste accumulation in our landfills and oceans. Ashton has a passion for science and technology, has exhibited at the White House Science Fair, and recently gave an inspirational TED talk about perseverance that has received well over a half million views. In addition to inventing, Ashton competed in First Lego League robotics, leading his team to win the 2016 FLL World Championship, and he continues to teach robotics workshops to local area youth in his hometown of Columbus, Ohio. More about Akash: Akash Manoj, an Ashoka Youth Venturer, is an Indian cardiology researcher and inventor from the state of Tamil Nadu. He is known for his award-winning research on “silent” heart attacks. He is the inventor of a device which could “non-invasively” detect and alert users about the beginning of the early stages of a potential asymptomatic myocardial infarction (heart attack). In 2017, he received nation’s highest honor for students from the President of India: The National Child Award for Exceptional Achievement.